The Garden of the Master of Fishing Nets is a nine-mu affair in the southeast part of the ancient city of Suzhou. Of all the Suzhou gardens it is unique for its small size and exquisite buildings, elegant landscaping style, and compact structure. 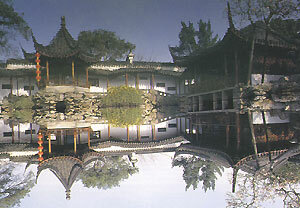 The predecessor of this garden was the Wanjuan Hall, the former residence of a Southern Song official by the name of Shi Shengshi. Right beside the hall is a garden named "Fishermen's hermitage". During the Qianlong Reign of the Qing Dynasty, the place fell into the hands of a man by the name of Song Zongyuan, who converted it into a garden and gave it the present name. The Garden of the Master of Fishing Nets constitutes east and west parts. As appropriate to the old Suzhou style in which dwellings were linked with gardens. entrance into the garden is gained by way of the back door or a side hallway of the former residence. Various buildings are found around a pond in the center of the garden. Despite the garden's tiny size, it resembles a water-bound land. Around the pond are such buildings as the Pavilion for the Advent of the Moon and Wind, the Duck-shooting Corridor, the Prunus Mume Pavilion, and Ribbon-Washing Pavilion at the Waterfront, which, though small, blend perfectly with the water surface. Taller buildings are tucked way behind trees, rocks and pavilions to render depth to the entire scene without being too oppressive to the water surface. This resourceful architectural layout is a salient feature of the Garden of the Master of Fishing Nets.